Is there anything more luxurious than spending time in a well-built home? Standing proudly on a hill surrounded by gorgeous mountain views, situated in one of the coldest areas of Colorado, the Fraser-Granby mountain valley, is a surprisingly efficient house. 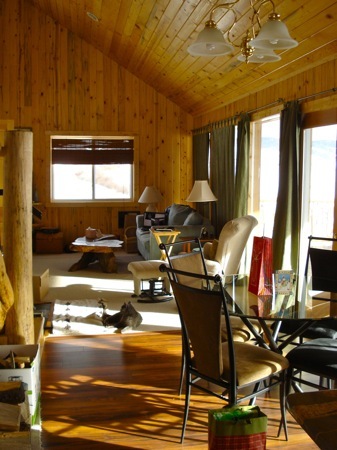 This log home incorporates passive and active solar features. It’s well insulated and efficient. 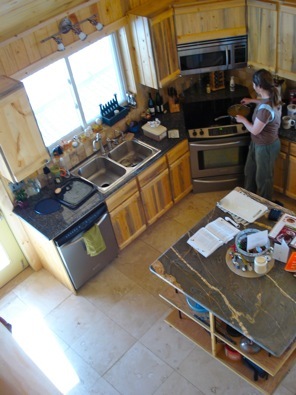 The contemporary active-passive solar house is situated and built to be cool in the summer and warm in the winter. It is a grid-tied (connected to the local electricity utility) house that is both efficient and comfortable. 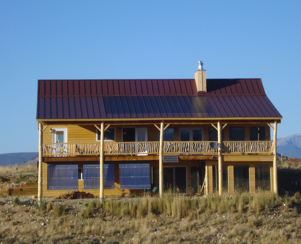 This two- part article will explore different aspects of active PV, solar evacuated tubes and the passive solar features of the grid-tied home. Oh yes, we’ll get into the guts and inner-working parts of the house in part 2. I visited the house both during the summer and in the winter to learn about its solar gain. The log home’s south facing side, with lots of windows to allow the winter sun’s heat into the house. The southern side of the house contains most of the windows, while the north side of the house (picture below) has a minimal amount of windows. If southern facing windows have a properly planned overhang, it can be situated in a way that blocks the summer sun, yet allows the winter sun to reach deep into the house. The porch on the southern side of the house is covered by an overhang that blocks the summer sun’s rays from entering the house, yet in the winter when the sun rotates a lower arc across the sky the sun’s heat can enter and heat the house. The north facing side of the house has a minimal amount of windows, cutting down on potential heat loss in the winter. This house has been built in a location has often been referred to as the “Ice Box” of the nation. Because windows are a liability in colder climates, they are typically the biggest source of heat loss in a building (besides an open door). The lack of windows on the north side of the house help minimize heat loss out the coldest part of the house. Most of the windows in this home are fixed (with no openings) and triple paned. Even with an expansive porch on the south side of the home, sunlight reaches deep into the house in the winter within a passive solar designed home. This picture was taken five days after the winter solstice and shows the winter sun’s rays penetrating deep into the house. In addition to passive solar winter heat from the sun, there is radiant in floor heat within the two floors that comprise the main living areas. The kitchen flooring is travertine, a rock-based material that has density and thus, thermal mass to absorb the sun’s heat, also helping to keep the house warm in the winter. This combination of design and its materials complement the home’s overall efficiency. The home gleams of luxury, with its marble counter tops, its slate stone tiled custom shower in the guest room, yet this house also includes scavenged materials. The owner builder used scavenged, high quality materials that were headed for the scrap-yard unless they were used. The guest shower has been made from ‘dumpster’ slate. The owner-builder said that the tiling the shower took a lot of planning, with a week of time spent arranging and grouting. Yet the shower, which I used, was luxurious. Had the owner not told me that it was dumpster slate, I would have thought every piece was cut exactly for the place and purpose it is in. It’s also worthy to note that almost all the lights in the house are compact fluorescent, using approximately 70% less energy than conventional light bulbs. The newer, more efficient kitchen appliances also use less electricity. The house is built almost entirely from beetle kill pine, and its blue tinged wood line the inner sanctum. The wood for the railings, posts, stairs & cabinets come from nearby because the house is located in one of the areas in Colorado that has been drastically impacted from the ‘beetle-killed’ pine trees. While having drastic ecological impacts, this situation has also created a surplus of timber. The most of the lumber for this house was milled locally, and the trees did not travel far, likely coming from within a 75 mile radius where the house was built. What is the cost of the house and what is the sq. ft. cost? The house is 3700 sq. feet including the loft, sunroom, garage and ground floor. I asked the owner-builder, and the cost is more difficult to access because it includes the land, attorney fees for an easement, access construction and utility taps. Will have to get back to you on the cost per sq. ft. I am studying architecture and have a project in which in which i have to make a car porch to the south, first problem is there is no enough space for it and the other is its a slope area, what if i make the porch directed to the second floor directly from the upper part of the slope. My site is in depressing, it is very lower side as compare to adjacent neighbor houses, it is a mountainous area. You can do it! Use your creativity to problem-solving abilities to design a beautiful and efficient passive solar home that will amaze people. Building on a hill, while initially challenging, has some inherent strengths to it. Use the hill to the north (it’s already bermed) to help to insulate it the structure. Depending on the slope of the hill, and the size of the plot, you may need to build up the hill. In that case, you have a lot of southern exposure. The car porch can also be a strength. That space can be used to gather electricity/heat, and store, or send the heat to other parts of the home. How cool would it be to have a Tesla car that can be charged with solar panels that provide both electricity for the car and shade for it to park under? Good point. Although if a car has studded tires, it can go almost anywhere, kinda like a solar tank, and one that’s quiet! Allow me please to post a different kind of question. Much appreciated to have an opinion. We plan to build two villas in Lefkas island western Greece for touristic purposes (May to October). The climate is warm in summer, high level of humidity (during August temperature might arrive at 45 degrees C). We definitely intend green passive solar construction. Are the typical rules valid ? Architects are in dilemma. We will operate mainly during summertime. Given the above mentioned circumstances are the windows going to be in southern part of building to gain heat of the sun or in the northern part which is obviously the cooler side ? The same question arises concerning the position of the swimming pool. North or south? Thank you in advance for your ideas. Needless to mention you are more than welcome to our villas right after the end of the construction …. Kefkas looks like a gorgeous island to be on. This is an opinion, and you should definitely work with your architects as they are familiar with the various local aspects such as climate, soils, proper orientation, overhangs and materials associated with passive solar building. 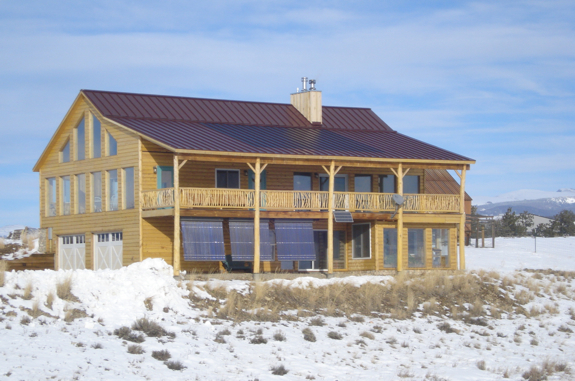 Building passive solar means being adjustable to local conditions and using the sun’s movements to design and build a structure that is optimally cool in the summer and warm in the winter – no matter where it is located. That said, for a tourist destination, the view also tends to be an important aspect in the build. While temperatures can get very hot in the summer in that location, if the windows are positioned on the southern side of the building, as the summer sun takes a high path through the sky, if the building is properly situated on an east-west axis, with a properly designed overhang, there shouldn’t be direct sun coming into the building from southern-facing windows. Because of this, combined with materials that have thermal mass, this type of design should keep the building cool in the summer. As for the pool, its placement would depend on many other design elements. It could be situated between buildings, on the side, toward the view, perhaps there’s a slope to the build, if there are active solar elements to be utilized to heat the water, its interplay with the other elements, combined with local climate considerations, for example, does the wind consistently blow in one direction? – can have a significant impact on the overall efficiency of the build. All these different elements make an impact, so it’s difficult to give recommendations without knowing all local, design, and climate considerations to be taken into account in a build. It sounds like a great project! Let us know how it all turns out – and yes, I’d love to visit sometime! 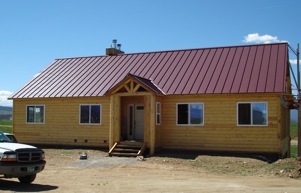 Hi Keya, We are building in Grand County Colorado and want to use this as a template for our home! Any chance you could put us in touch with the company that did the solar & solar hot water? Thanks! The local person in Grand County is Guy Larson, and is a one-man-show and knows his stuff. Golden Solar was used for PV, but has since split into two companies. Shawn Josserand was the one that finished work on this house. It was also mentioned that during the build, the Denver Home and Garden show was visited and contacts were made there. Best of luck, and would love to hear how it all goes!